John Duffy's first match in charge is at Toulouse. FEATHERSTONE Rovers end their Kingstone Press Championship campaign by visiting Toulouse on Saturday in new coach John Duffy’s first game in charge. They will be out to avenge a 34-26 home defeat against the French side four months ago. Rovers are already assured of a place in the Qualifiers while Toulouse and Halifax are vying for fourth spot. Toulouse are fifth in the table, two points adrift of Halifax but with a far superior points difference. If Toulouse beat Featherstone, Halifax would need to take at least a point from their game against table-toppers Hull KR at The Shay on Sunday to make the top four. If Halifax and Toulouse both win, Fax would finish above Featherstone in third place. 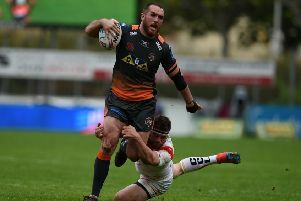 Toulouse boosted their top-four hopes with last Sunday’s shock 31-30 victory at Hull KR when they ended a four-match losing run that saw defeats against Halifax, Oldham, Dewsbury and London. Rovers centre Chris Ulugia is set to miss the rest of the season after being injured in the second-half of last Sunday’s 28-8 home defeat against Halifax. Uliugia damaged a shoulder that he had previously had repaired. Rovers have released forward Michael Knowles who has joined Dewsbury Rams with immediate effect on a deal until the end of 2018. Meanwhile, Rovers captain Ian Hardman will bring the curtain down on his testimonial year with a casino night at the LD Nutrition Stadium on Friday, July 28. Tickets are priced at £25 per person. There will be a three-course meal, with casino tables, cocktail bars, auction items and raffle prizes. Hardman said: “I really appreciate everyone who has helped make my testimonial a special part of my career. “We have staged some fantastic events and huge thanks must go to my committee for helping making them a success. Latest £500 Rovers lottery winners: S Webb (I4318), J Taylor (I4235), P Vickers (J3169), R Fox (G1389). Friday - No winner, (rollover). £5 consolation prize: S Horobin (V4035).